This past holiday I visited Barberspan on two occasions. After a very successful trip there in October, I was anxious to visit this haven again. 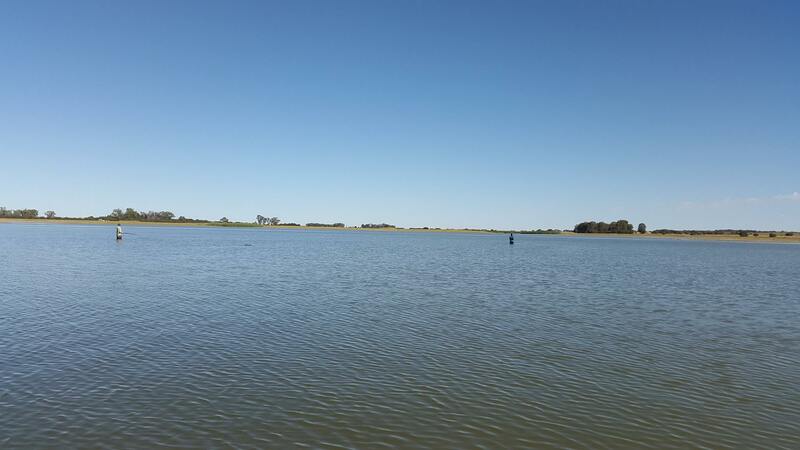 Koos and Evert was also very keen to fish this venue for the first time after they saw some of our catches from the October trip. We made an agreement that we need to do a trip in December. Unfortunately, Evert couldn’t join us on the first trip as he wasn’t on leave yet. 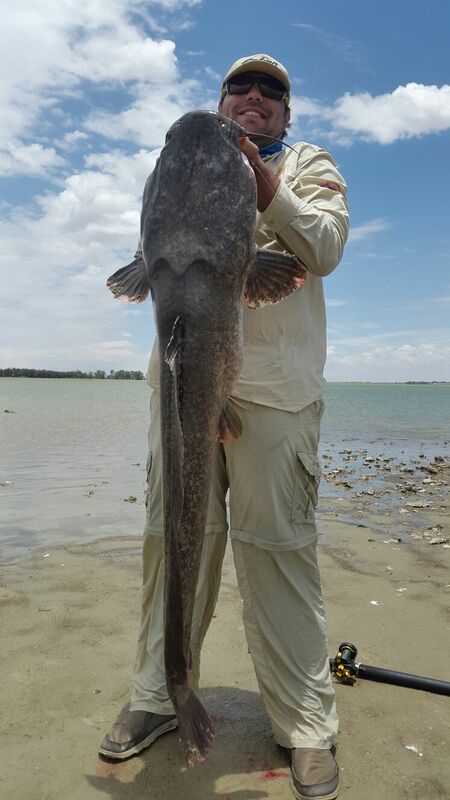 Luckily, one of my good friends from my Junior days, Chris Janse, would be visiting me from the USA for a few days and naturally I thought that there is few better options than putting him on his first catfish on calling – now that’s what I call a true South African experience! One of Koos’s friends; Victor, was also keen to join us on this trip. So, were left with Droomvanger and Kakiebos to see what the pan has to offer this time around. We booked one of the chalets at Barberspan Hotel for this trip. After we got settled in our chalets we decided to launch the boat and wet our lines. The launch was quite a mission as the water level had dropped severely since our last visit, seems like this water is another victim of the never-ending drought facing South Africa at this time. The water temperature has dropped since our last visit and the wind was blowing which made so uncomfortable waves – a bumpy wet ride for every one crossing this unsettled piece of water. Once we arrived at our spot we pulled our boats ashore and secured them with our anchors. Each of us took our calling rods and head in pairs in opposite directions to work down the bank. 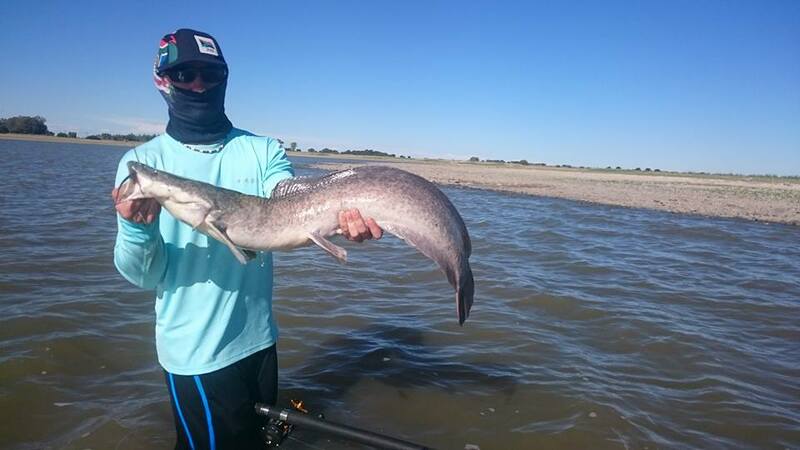 Koos and Victor broke the ice after they nailed a few catfish of a jetty. Both of them enjoyed this thoroughly, especially when Victor landed a decent specimen of 9 kg. Victor even had an audience who viewed in awe while he battled with his beast. I belief this is not something that bird watchers see every day. Chris was also lucky enough to land his first catfish on calling; he followed it up with a few more small ones. I belief he enjoyed it as this is very exhilarating experience – especially when experienced for the first time! I also managed to catch several small catfish as I worked down the shore. I continued wading down the shore in search of a change in structure when I noticed a promising looking point ahead of me. I headed towards the point and waded in cautiously without causing much of a disturbance. After wading in knee deep in the water I commenced calling; hitting my lure nine times on the same spot on the water and then I let it sink down underneath my rod’s tip. I waited a few seconds…then I felt a mighty knock and my rod’s tip was pulled below the water surface! The fish stormed off to the deep – it was a big fish! The catfish was very strong; every time it stormed off it pulled me a few steps forward – enough to get any angler’s blood pumping! After about 10 minutes of intense pulls and heart-stopping action, I finally managed to tame the beast! I pulled the cat out on the shore. 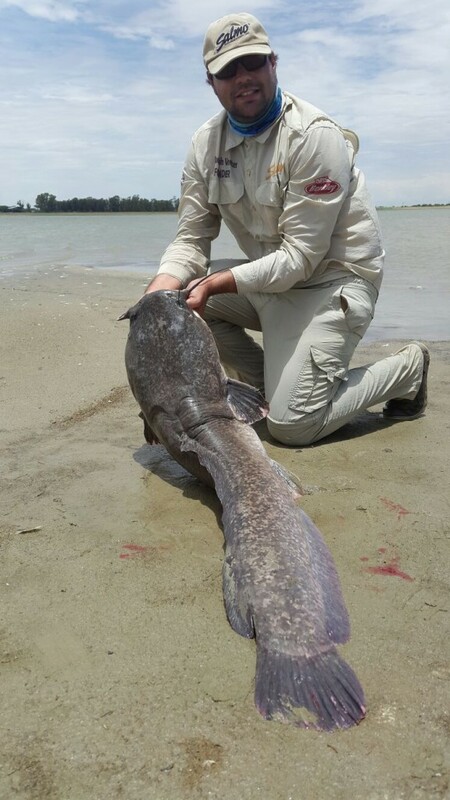 It was a classic Barberspan catfish – massive head with a not so long body! We weighed the cat which pulled the scale on 18.3kg – a good catch and not a bad catch for the first day. After taking a few pics, the fish was revived and released for another day! Not long after, a massive storm hit us while we were out on the water. We saw the rain approaching and accepted the fact that we were about to get soaking wet as we wait for the storm to pass. So, each of us grabbed a beer and went to sit on a sand bank to watch as the storm approaches. As predicted the storm hit us hard and the rain came pouring down, but we could easily handle this as each of us had a cold one in our hands to lighten the burden. As if we getting soaking wet were not bad enough, the wind suddenly changed direction which caused waves to break over our boats that was anchored on the shore. We left our beers on the shore (sad part of the story) and raced towards our boats as we struggled to turn our boats with its front facing the storm. Standing knee-deep in the water while the wave are smashing over your boat and thunder is lighting up the sky around you is no fun at all! After an intense time saving our boats from being smashed to pieces against the shore or being sunk from waves smashing over our boat, the storm finally settled down. We secured our boars once again, after which we hit the water again armed with our calling rods. I had a very good feeling about the angling we would experience in this short time before dusk; with the heavy rain coming down, the waves pumping oxygen back in the water and the absence of wind – we were in for a treat! I waded in about knee-deep in the water and splashed my lure about 9 times on the water surface…a few meters from me a massive dust cloud appeared! Then a MONSTER catfish appeared underneath my tip, eagerly looking for its prey! It missed my lure and slowly swam away, but I managed to place my lure in front of it! SMASH and I was ON! Suddenly everything happened in slow motion. 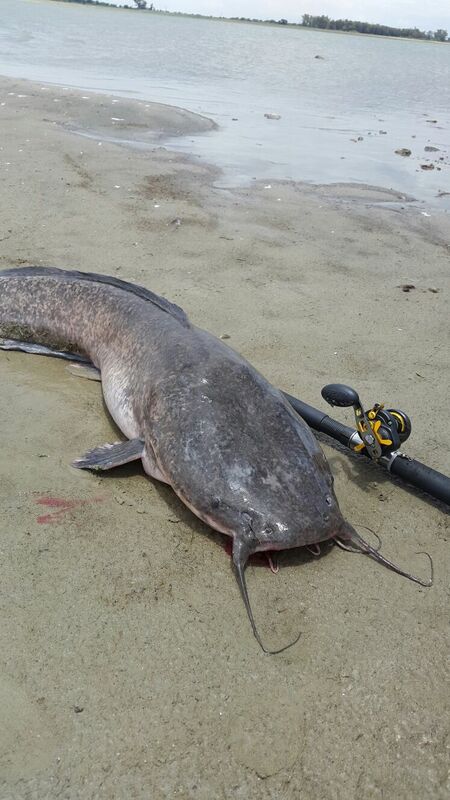 As I set the hook, the catfish immediately surfaced and gave a few mighty head shakes! My lure departed from the cat’s jaws and my hope turned to dust! 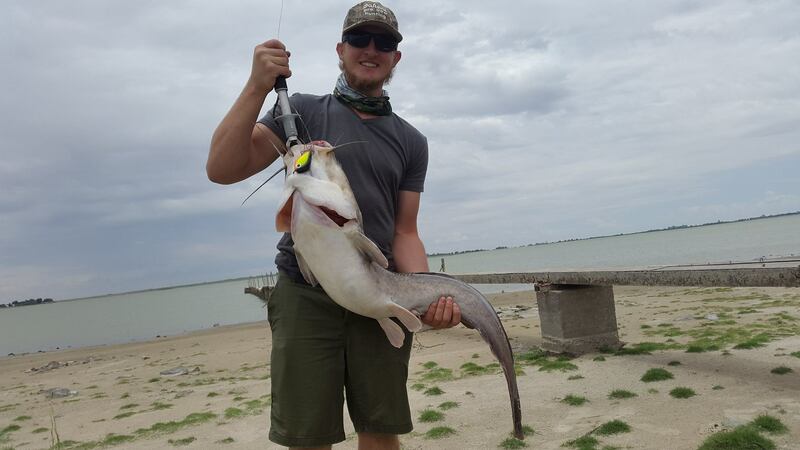 I saw how the catfish disappeared below the stained water and I was left to cringe in agony – this was the biggest catfish I have ever hooked, the biggest I have seen in real-life! 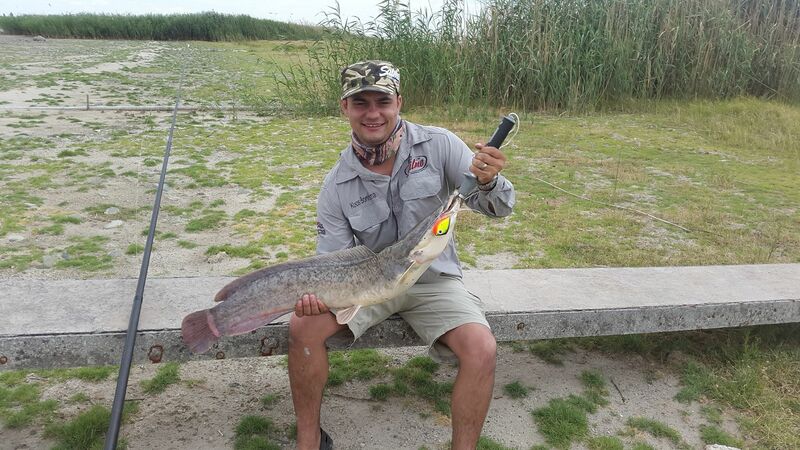 I estimate its head to be around 40 cm wide and the fish was no lighter than 25 kg, I’m actually leaning more towards 30 kg and I had it ON! After this fish my spirit was broken and I needed some time to recover (maybe a beer or two would help – unlikely though as it was just so HUGE!). It was getting dark and the wind was picking up again, thus we headed back to the hotel.